- Lactose and GLuten Free! The critically acclaimed world of Nectar®! Gone are the days of low-quality whey protein. Gone are the days of those blah-tasting protein drinks that promise much but deliver little. Nectar® once and for all breaks the mold by combining Promina™, the highest-quality whey protein isolate ever developed, with a flavoring system so fruitilicious that you will never drink a different whey protein shake again. 4. What process is used to instantize Nectar®? Nectar® is instantized by combining two separate technologies . . . agglomeration AND lecithination. Unfortunately, some other protein powders use only one of these techniques which is why they clump and dissolve into solution incompletely. Nectar® always stirs in perfectly. 5. What is the sweetening agent in Nectar®? The entire Nectar® line, except Nectar® Naturals, is sweetened with sucralose and acesulfame-K. Nectar® Naturals is sweetened with the natural sweetening agents erythritol, stevia extract and monk fruit concentrate. 6. Does Nectar® contain any carbohydrates or lactose? Nectar® is practically devoid of any carbohydrates or lactose and is safe even for those who are lactose intolerant. 7. Does Nectar® contain any fat? No. Nectar® contains 0 g of fat. 8. Who should use Nectar®? Nectar® should be consumed by everyone who wants the best-quality and best-tasting whey protein powder on the market to supplement their protein needs. Ideal individuals are bariatric/medical patients, children, teenagers, the elderly, fitness enthusiasts and anyone who desires or requires an additional source of daily protein. 9. Why does Nectar® only contain whey protein instead of a blend of different protein sources? Whey protein is the cleanest-tasting, blandest and most soluble protein available. These qualities are essential for delicate and delicious flavoring systems, such as our fruit, latte and sweet flavors. 10. What is the best way to mix Nectar®? Nectar® is fully instantized, which means it quickly and effortlessly stirs into your preferred liquid with just a spoon. 11. What is the serving size for Nectar®? A serving of Nectar® is 1/4 scoop and should be mixed with 2–4 oz of water, depending on taste preferences. One full scoop, which provides 23 g of protein, 0 g of fat and 0 g of sugar, may be mixed with 8–16 oz of water. Nectar® Lattes and Nectar® Sweets also taste great in milk. If mixing in milk, please note the extra calories. 12. How many times per day should a person consume Nectar®? This depends somewhat on a person’s needs and desires. 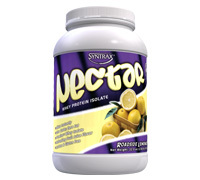 However, the majority of users consume at least one scoop of Nectar® two–three times per day.